What are you gonna do next year? I've never been much for setting resolutions at the start of a new year. This is probably because I used to make a list up every year but never seemed to accomplish anything on that list and become depressed by the time Thanksgiving rolled around. Last year-2005-I set one goal for myself. To lose weight. A few weeks before Christmas last year I realized I no longer had any pants that fit so I headed for the thrift store. To my Husband's dismay this is where I buy alot of Jeans for about $4 each. That trip was the motivating factor for my resolution. I had to buy size 16 jeans and I weighed in at almost 180 pounds. I had been here before. For both my pregnancies I was as big as a house and nothing fit but those years don't count. It also took me back 20 years. I was 13 years old, 210 pounds, size 18-20, and going to start high school in the Fall. By the start of 9th grade I had dropped 60 pounds and bought clothes in the non-plus size section of the store for the first time in years. This was also the same time I decided to stop eating meat. For the first 13 years of my life I had been the fat girl but no longer. I pledged to never again feel as overweight and out of shape. Here I sit on the last day of 2005 with my goal accomplished. I'm 50 pounds lighter and in a size 6 jeans. I did it. Maybe my goals in the past seemed so unattainable because I set too many. Maybe I work better with having that one goal staring me in the face instead of the ten things I'd like to accomplish. So I've been thinking about which goal I should focus on for 2006. It would be nice to set goals of moving to a different climate or taking a vacation out of the country. I must be realistic with my goal and these two just don't fit into my budget for the New Year. In 2006 I am going to try to become more organized. I can see a future where I need a specific document and I'm able to locate it in 5 minutes or less. I will be able to answer the calls of "Do you know where my ........... is?" I will have a place for everything and clutter will be a thing of the past. Hey if I can accomplish my one goal of 2005 I am very optimistic I can conquer one goal in 2006. I have lots of mini goals like learning to knit more efficiently and making lots more yarn(and wire?) 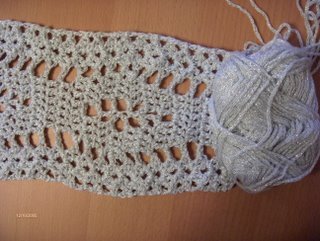 projects in crochet and knit. Having such fun goals could take over the one goal of the year. As long as I work on keeping the yarn stash and works-in-progress somewhat organized I will be working on my one major goal, right? So, now that I've written my goal down, what are you gonna do next year? I finished up my last Christmas gift project(a suede keyhole scarf) last night with a few sit-n-stitchers. We celebrated our one year anniversary last Monday. Can't believe we've gotten together for a year now. I'm looking forward to our road trips after the New Year to the yarn store of course but also a bra fitting? You put a group of ladies together, add wine, and interesting conversation will occur. I'm excited that I can finally pick something out to make for myself. 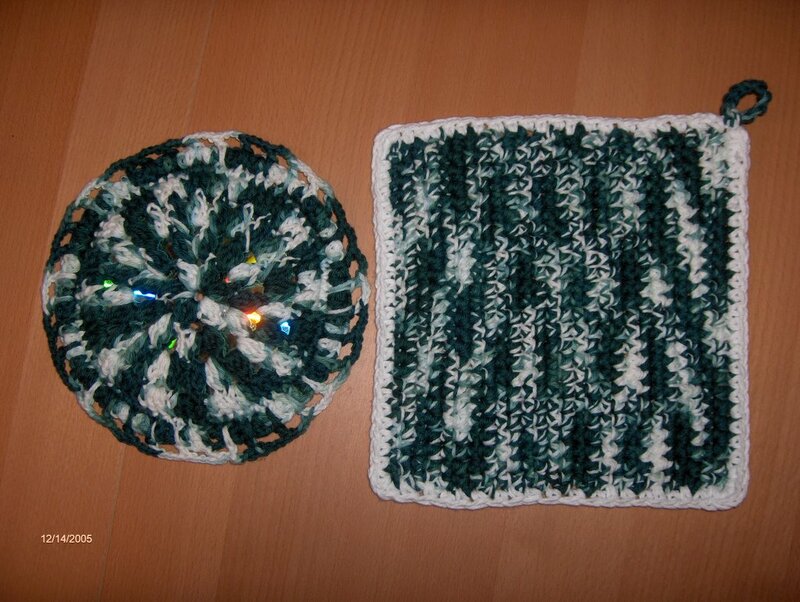 Although I find it much easier to finish projects for other people. Now I'm off to bake cookies, make gingerbread houses and enjoy the last few days before Christmas. 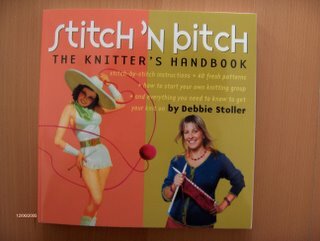 Happy Stitching.. It can be hazardous to your hands. Every year this holiday sneaks right up on me. I swear somehow my calendar flies by on fast forward from Halloween to the end of the year. Here I sat Wednesday with a concept of two teacher gifts that needed to be delivered by that same evening. I decided the best route was to follow a suggestion to whip up some hot pads. 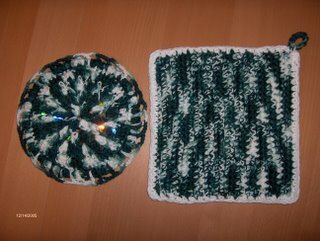 I doubled up on the cotton yarn to add thickness quick. By the end of the project I actually had a blister on my little finger. Note to self, next time start projects in July. Especially the ones involving cotton. I decided to give gift cards to the rest of my extended family clan but that concept was shot down by my husband. "Gift cards are so impersonal." Yes they are, but they are perfect for the procrastinator in me and they are very practical. 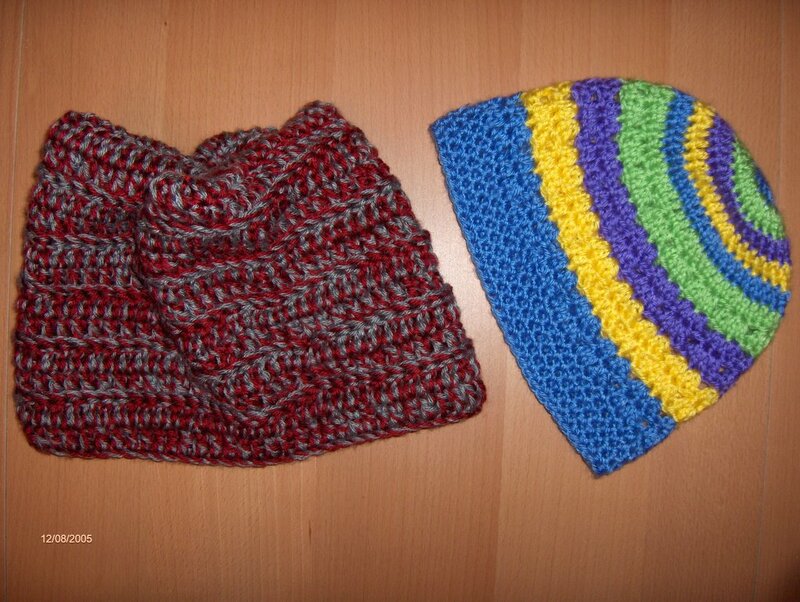 So I finished and sent out another hat/scarf set along with the Chenille set. I started a scarf last night for my Mother-In-Law in Southern California. Oh how I dream of the day where I'm stuck in Sunny, 70 degree December weather. Back to reality. I don't have the time for California dreaming. Hey, at least I don't have to dream of a white Christmas. Two projects left to start/complete in 8 days. 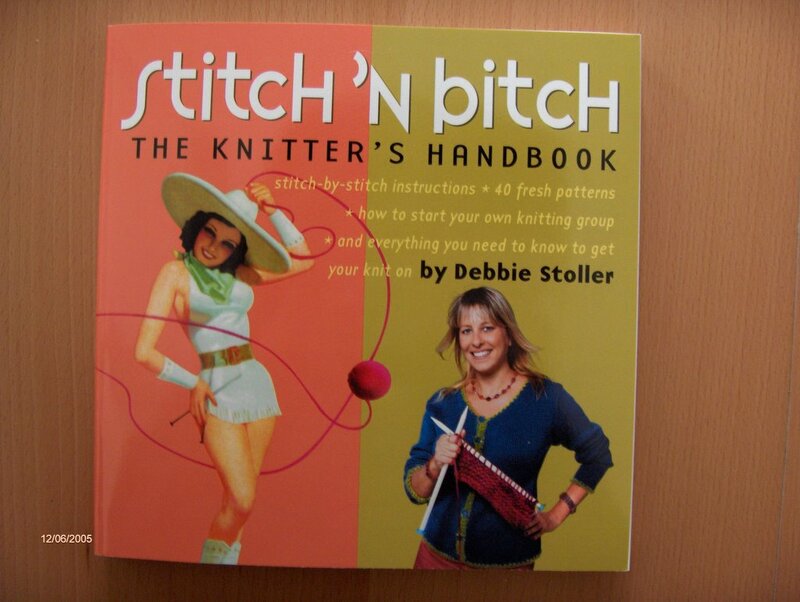 Happy stitching-have a great weekend. This is what I'm hearing from my kids today after a beautiful snowfall overnight. The 3rd grader was certain school would have to be closed. There's a huge sledding hill that's calling his name and that would be so much more fun than sitting at a desk all day in school. The 4 year old came down with a bad chest cold which turned into pnemonia a couple of days ago. His begging to go outside to help me shovel was a good try but didn't work. 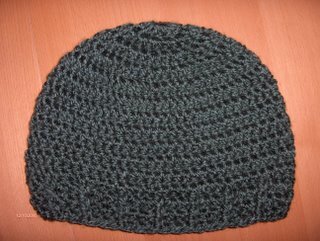 I've been trying to complete some of the many projects on my knit and crochet list. I finished two hats to go with previously posted scarves. 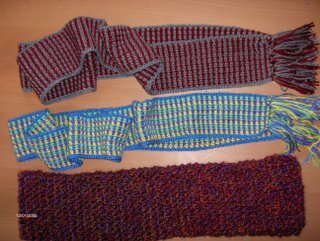 I made a knit chenille scarf that my son loves to wear but I didn't like the way it looked when it was finished. 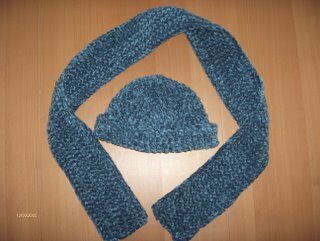 I still had 2 skeins to use up so I decided to crochet a scarf and hat set. 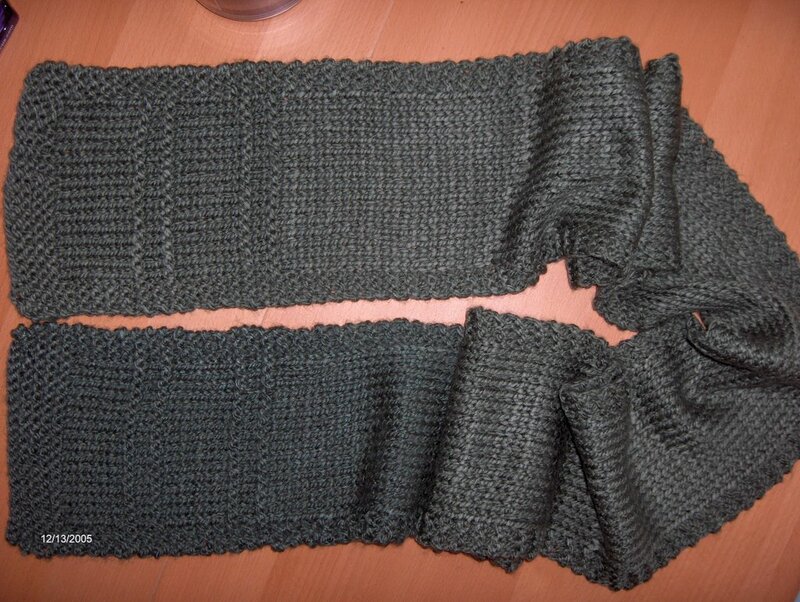 I crocheted the scarf lengthwise and I like the look of it. The hat was a simple single crochet in a round and I finished it in about an hour. As easy as it was to whip up I'm glad to be rid of the chenille. Kathy knows my happiness. Have a great weekend. "16 days left"
Look what I received from St. Nick. Three down and more to go. 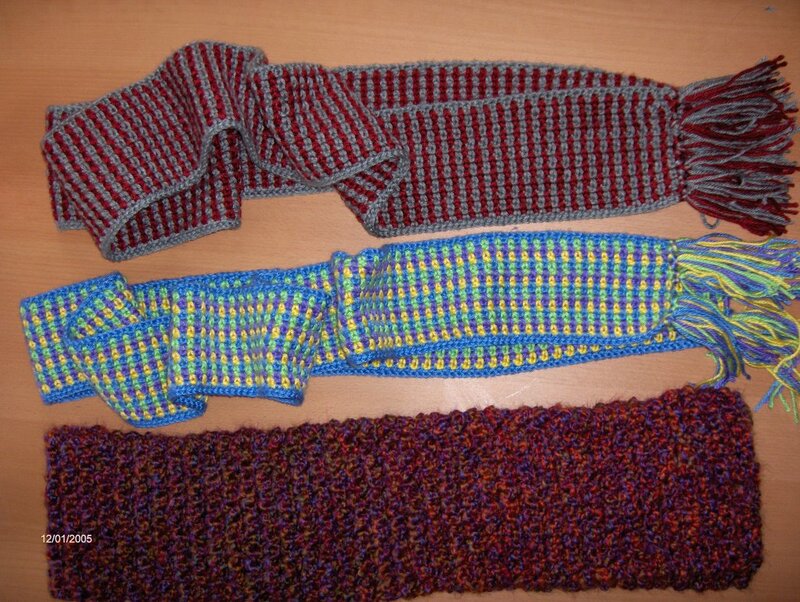 I finished 3 scarves to be given away as gifts. The Homespun is my first knit gift. Keep stitching-23 days until Christmas.